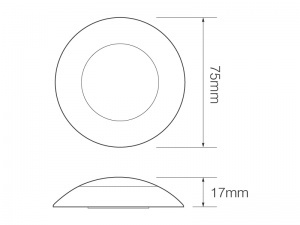 These 12V surface mounted, interior courtesy/down lights from LED Autolamps are 75mm in diameter and 17mm deep with a chrome surround and are available with 4 lens colour options to suit your application. 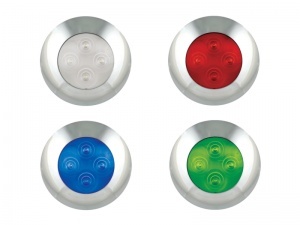 They are fully waterproof so suitable for internal or external use as general lighting, courtesy lighting or 'mood' lighting. Ideal for use in motorhomes, caravans, campervans, vans, trailers, boats and commercial vehicles. The surround unclips from the LED unit to access the 2 fixing holes (screws provided) and termination is made using the flying leads. Available with soft white, red, blue or green lenses and sold individually. This is an excellent product, and being LED based will reduce the power consumption on my boat. I shall use 12 volt planet products again in the near future.